What Returns Can an Investor Expect in the Stock Market? The first question most beginning investors ask is “what kinds of returns can I get in the stock market?” It’s an important question, because obviously the higher the returns you achieve, the quicker you can ultimately reach your financial goals. And while everyone has heard about legendary investors who have made fortunes in the markets, such as Warren Buffett, George Soros, and Carl Icahn, the question remains that without the intelligence, acumen, and luck(?) of these investing giants, can the average person still do well? I want to explain why I believe that the answer to that question is definitely yes. But to do so, I’ll need more than just one post, so this will be the first article in my “Stock Investing Basics” series. Stick around for a crash course through the basics of how and why you can still reach financial independence by investing in stocks. Before we get into the potential returns you can make in the markets, let me first address some myths that people often have. I see this often as a financial advisor–people typically have very unrealistic expectations when it comes to investing. They either think that there is some “secret” knowledge that only rich billionaires have that allow them to make huge returns with little risk, or they think that the markets are “rigged” against the small-time investor, and there’s no reason to even try. I’m here to tell you that neither of those extremes are true. The fundamental nature of the stock market hasn’t changed in decades, despite what you might hear. The financial news wants you to believe that everything has changed, but the stock market’s ability to grow wealth over time is still available to anyone that will learn the basic rules. So as we take a look at the returns of the past, remember that there was nothing special about these time periods. Sure, there was a demographic boom, credit expansion, and a falling interest rate environment that helped, but there was also a World War, crippling inflation, and several massive global recessions. There were challenges then just as there are challenges now. So, as we discuss how the stock market has done in the past, hopefully you’ll get an idea of what you can shoot for in returns on your stock investments in the future. Now, of course, I obviously have to say that I cannot predict the future, nor would I attempt to. I will gladly admit up-front that I have no “crystal ball.” And to some degree, the old adage that “past performance is not an indicator of future results” is still true, especially on the level of an individual company’s stock. However, I do think it is reasonable to expect that, given all the challenges and hurdles that society has overcome over the last 90-100 years, we can turn an eye towards the past to see at least the historical precedence of the markets, and to draw some instruction from it. From 1926 to 2015, the S&P 500 index returned an average of about 10% per year. 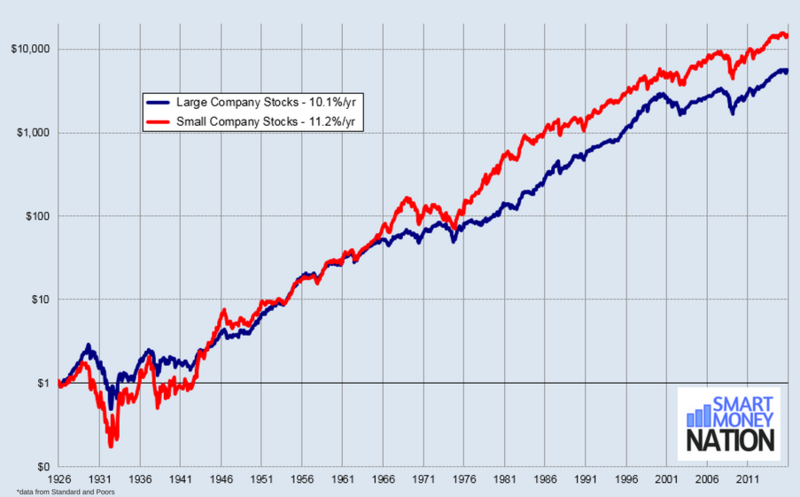 (Just for fun, I’ve also included the returns for small company stocks, which have made about 11% per year on average.) To put those numbers into context, with a 10% return each year, your money doubles about every seven years. So let’s assume you’re reading this at age 25, and you have $10,000 invested today. Even if you don’t add another penny to your account, by age 32 you will have $20,000 in investments. By 39, your money has doubled again to almost $40,000, and if we keep this up, your original investment of $10,000 has become about $550,000 by age 67. That is the power of compounding interest, and it’s especially powerful when the rate of return is in the double digits! Of course, everyone wants to get double-digit returns like these. But if anyone tells you that you can get good returns without any risk, you should run, not walk, in the opposite direction. 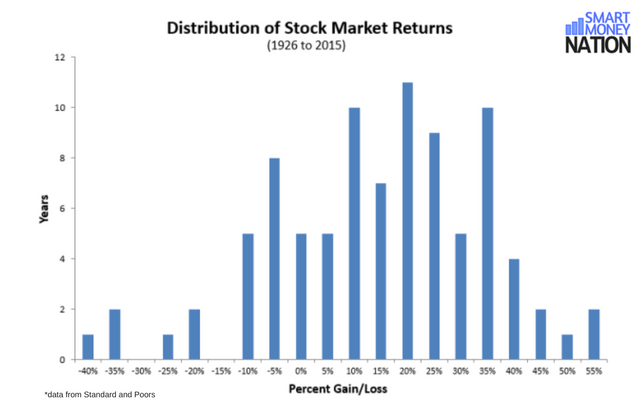 Even though it is true that the average total return of stocks was between 10-11% over this period, most of those years were significantly above or below that amount. In fact, only about 20% of the time did the year end with a return between 5% and 15%. The other 80% of the time, it was much higher or lower. Take a look at the next chart to see how those returns are spread out. More importantly, there were a few years of very significant losses in the markets, with six years ending in losses more than -20%. While six years out of ninety is only about 7%, anyone reading this is likely to remember the Great Recession of 2008, when stocks were hammered to the tune of -37% (and mid-year it was actually much worse.) If you had money invested during that time, I don’t have to tell you how painful that can be! Clearly, the big takeaway from this information is that investing in stocks is not for the faint of heart. If you are going to put your money in the market, you should know that returns are likely to vary widely, and that significant losses are possible, at least in the short term. (Remember that the 10-11% average annual return includes the bad periods of -35% returns.) This is why stock investing is for long-term goals, not short-term speculation. In my next post, I’ll talk more about how long you should plan to hold stocks to minimize risk and maximize your return. Until then, I would love to hear your comments and experiences with the stock market, so leave me a note below! *Prior to 1957, the S&P composite index consisted of 90 of the largest stocks. PreviousThe IRA vs The Roth IRA — Which Should You Choose? A former high school teacher and soccer coach, Curtis loves combining his passion for personal finance with the heart of a teacher and a coach. He loves diving into a financial topic with a client, and helping them fully understand their options. As a Certified Financial Planner with over 15 years in financial services, Curtis assists clients with complex financial situations on a regular basis, and counts it a privilege and an honor to continually earn his clients' trust.